This is basically what all us lovely students looked like on campus today. So. 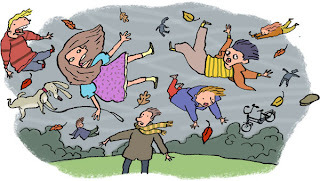 Just wanted to say good-bye in case our apartment gets blown away by the ridiculous wind and I never get a chance to say "thanks, its been a good life." I am scared. Its intense. Luckily, I was the smart one of the little piggies and live in a brick building. Hope that keeps me safe through all this huffing and puffing! I am thinking some cocoa and a good snuggle with my Mister would make me feel safe and secure. Or maybe a good round of Monopoly. I'll try it out. Let you know. one would think you would be use to the wind living in the tricities for so long! it was really windy here last week too! our trampoline blew across the yard and into our fence! also, you are not a failure for not posting a blog i over a week! i have those weeks too! instead, i post like 5 blogs all in one day trying to catch up for all the other missed weeks!